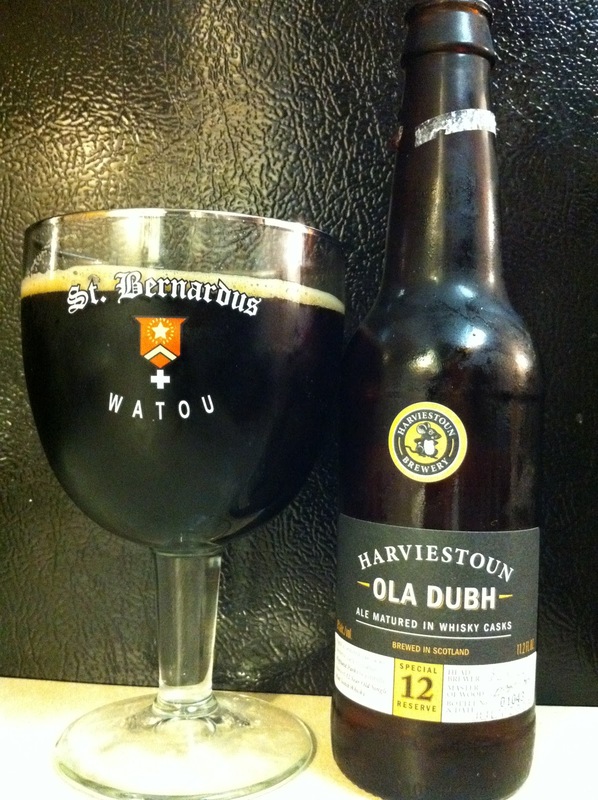 Now for a couple of Scottish beers from the Harviestoun Brewery in Alva, Scotland. 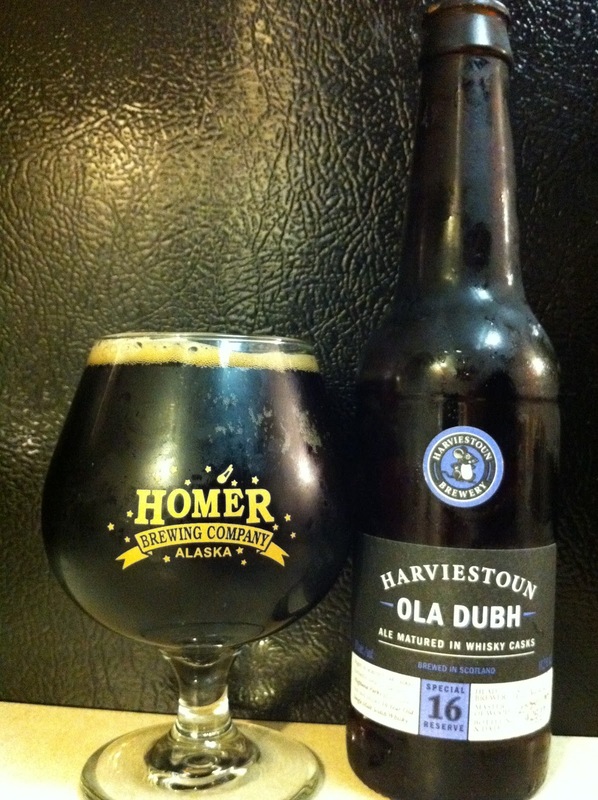 The "Ola Dubh" series is one of their most well known lines of beer and it's the product of a special relationship between the Harviestoun Brewery and the Highland Park distillery. A few years ago I wrote about the Ola Dubh 30, which is aged in 30-year old Highland Park scotch barrels. The name "Ola Dubh" translates to "black oil" and as you'll see, they earn that name. For this round, I picked up the Ola Dubh 12, and Ola Dubh 16, aged in Highland Park casks representing that particular length of aging. I found these beers at the new (relatively) Cuban Liquor store on Perkins, and decided to give them a taste. First for the 12... it's very dark, and impenetrable when held up to a light. It has a very small off-white head with a little retention but not excessive. It really does live up to the "black oil" moniker when it comes to the appearance. The aroma is very rich, dark fruit and caramel and booze, and a little chocolate in there as well. The taste has a lot more smoky scotch flavor than the aroma. There is not as much caramel or dark fruit, but it's still good. I like that it's different from the aroma. Up next, the same series, just aged in the 16-year Highland Park barrels... for this one I poured it into a snifter from my friends at the Homer Brewery. It's a really dark brown, on the verge of black with a minimal head. It seems slightly lighter than the 12. The aroma is strong with molasses and raisins and a little boozy burn riding on a hint of caramel and vanilla. The scotchy smokiness comes out more in the flavor, covering up some of the sweetness of the aroma with a smoky, roasted overtone. Very nice! And going back and checking my score for the Special 30 Reserve... also an A-! Although that review was from late 2009 and my palate has changed since then, I gave that one a 4.08 so slightly below the 12 and 16. Very interesting, although what I really get a sense of is that it's the type of scotch in the barrel that makes the biggest difference, not how long the scotch was in the barrel prior to using for beer. Very interesting beers, so check them out if you have the chance!